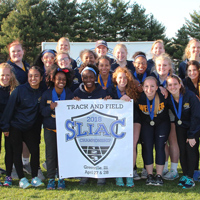 Webster's women's track and field team won an all-academic team award for the fourth time in the last five years. Webster University's women's track and field team was honored by the U.S. Track & Field and Cross Country Coaches Association (USTFCCCA) with a 2017-18 All-Academic Team Award. Senior women's track and field athlete Meghan Illig also earned NCAA Division III All-Academic Honors for 2017-18. Webster has now earned a USTFCCCA All-Academic Team Award for the fourth time in the last five years, including three straight awards from 2013-16. The women's team, which is coached by both Dan Graber and Nick Neihaus, had a cumulative grade point average of 3.23 among the 27 women that competed during the 2018 indoor and outdoor seasons. Illig earns USTFCCCA All-Academic honors in Division III after finishing the season ranked in 28th nationally in the 400-meter hurdles. That was one of numerous honors for Illig, who also set four new Webster records. She was named a CoSIDA/Google Cloud Academic All-District selection, an SLIAC Spring All-Academic Team honoree and is also a nominee for the 2017-18 NCAA Woman of the Year Award. She was also named the SLIAC Women's Track Athlete of the Year after taking home SLIAC titles in the 100-meter hurdles, 400-meter hurdles and 4-x-400 meter relay and earning All-SLIAC honors in those three events, along with the 200-meter dash and 400-meter dash. She also helped lead Webster to its first-ever SLIAC title in women's track and field. Read more about the team and Illig's accomplishments in this Webster University Athletics story.